A market uncertain of supply and costing is a market in turmoil. But it is also a huge opportunity for the innovators who present the timely alternative. That’s the situation today in the grating and structural market, where FRP grating and structures are now cost-competitive with equivalent steel grating. New tariffs on steel have added 25% to the cost of imported steel products. In an already volatile market, this new cost factor has it has meant a sharp jump in prices for many steel products and has thrown supply chains into disarray. Raw steel producers can profit as they raise prices to match the new higher price of imported steel. However, if you incorporate steel into your work, it means that getting a reliable supply at a reasonable price just became much more difficult. Stressed-out clients who wonder what happened to their budget may cancel or alter their plans. How big is the effect? Colossal. As the newsletter Supply Chain Dive points out, “the steel industry employs 140,000 workers, while 6.5 million work at downstream manufacturing companies using steel.” Higher steel prices affect many. Distributors and fabricators need to pass on higher input costs to stay in business. Crain’s New York reported back in March that prices were jumping on some steel items used in handrails and other fittings. In November Kahn was selling steel tubing for $38.90 per hundred pounds. Now he is getting around $62. Plate steel prices have gone up roughly 15% since November. Fabricators worry about the effects of higher steel costs. Interviewed by the Weekly Standard, SteelFab owner Glenn Sherrill is worried that the rising steel prices will cause clients to question the use of steel and limit plans to use the steel railings he manufactures. His company with 1,000 employees now struggles to honor the contracts he made at lower steel prices. “The tariffs are really bad for us,” he says. If you are in construction, fabrication or distribution, high steel prices affect your ability to do business. What good can come from stressed-out clients and expensive steel? A golden opportunity: a chance to examine the durable, attractive and proven alternative to steel. FRP grating and structural components from National Grating offer excellent performance, are much lighter to handle and come with a choice of finishes and colors. FRP is incredibly strong, outdoor durable, does not need painting because it will never rust. For a time, FRP was viewed as a premium price product. But costs for FRP have been steady or lower, especially when sourcing from a wholesaler like National Grating, with stock in distribution centers across the USA and Canada. FRP offers cost certainty. Unlike volatile steel prices, FRP prices can often be held for 30-90 days and longer. No more last-minute surprises. FRP offers your clients a superior alternative with lower long-term maintenance costs. It is also incredibly easy to work with. With National Grating’s technical support and nationwide distribution network, we have the technical information to help specify the product you need. Advantages of FRP include: corrosion/erosion/UV/fire resistance, significant weight savings, safety/ease of installation, anti-slip properties, and low electrical/thermal conductivity. With a complete line of FRP gratings for every application, FRP structural shapes and compatible fastening systems, you can add a durable and versatile alternative to your product offerings. FRP Grating from National Grating weighs a fraction of steel grating for equal performance. It is much easier to transport, fabricate, handle, install and maintain. And it will not degrade and deform like rusty, corroded steel parts inevitably do in real-world conditions. 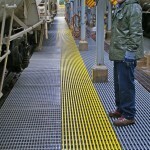 Non-slip gritted surfaces prevent slips and falls. Lightweight FRP makes handling, installation, removal and maintenance much easier. FRP reduces the risk of back and muscle strain so common when working with heavy steel grating. FRP performs for years in the harshest of conditions, including extreme chemical environments. Properly installed, FRP is safe for agricultural and food processing environments, too. Our FRP comes in several colors and will never need to be painted. Stripping and repainting of steel is a costly and messy job. 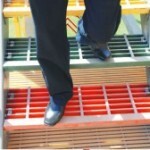 Integrated color is another reason why FRP grating is the best alternative to steel grating. FRP lasts and lasts! Fiberglass reinforced grating, panels and trench drains will not degrade and deform like rusty, corroded steel parts in real-world conditions. FRP Grating is THE alternative to steel grating. National Grating provides Fiberglass Grating for industrial, food processing and public works to all major cities. We understand the needs of building contractors and facility owners – we have a long history of supplying fiberglass reinforced drain grates for industrial and public projects like yours. Whether your operation is agricultural, public space, WWTP, chemical processing or any other location where an alternative to steel grating is required, we have the drain and trench grate options for safe operations. 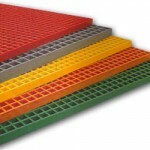 Our pricing and service experts are standing by with fiberglass grating in stock and expedited shipping. We commit to supply your project with molded or pultruded Fiberglass Grating at the best possible price with the lowest freight charges.